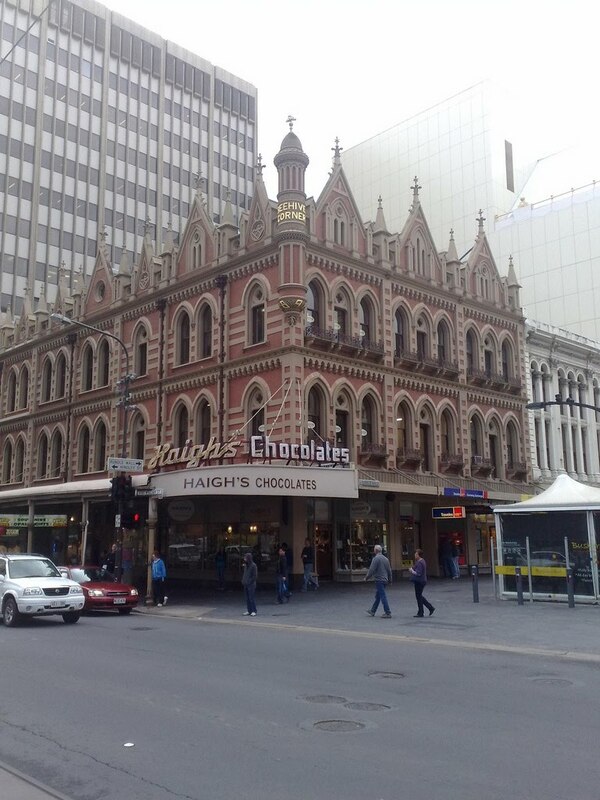 One of Adelaide's biggest landmarks is the corner of Rundle Mall and King William Street, known as Beehive Corner. If you look up you'll spot the landmark insect buzzing over Haigh's Chocolate. 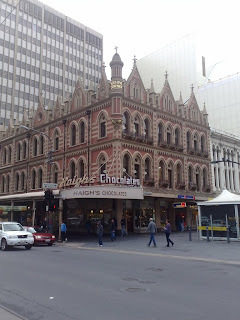 Almost ready for its 100th birthday, the first store appeared here in 1915 and their luxury chocolates have spread to Victoria and New South Wales. But there's something special about getting them here at the source. Their chocolate frogs pre-date Harry Potter's sweet-tooth as they've been selling them for 67 years. Today they offer them in peppermint and dark and reckon they sell more than a million a year. But the frogs are getting pushed aside by Adelaide's Panda-monium and you can now buy large chocolate blocks in the shape of Adelaide Zoo's Wang Wang and Funi. Plus there's truffles, blocks and choc-coated fruit. But the best thing about visiting the Haigh's store is coming out with a free sample - they usually insist on giving you a taster at the cash register. Oh, now you're singing my tune...chocolate. I'll have to buy a ticket to travel from Melbourne to Adelaide to get a free sample. But wait a minute. Is that logical? On the other hand, I am descended from a woman who bought a train ticket to go to the City because she had been undercharge a farthing. Yep - Scottish.